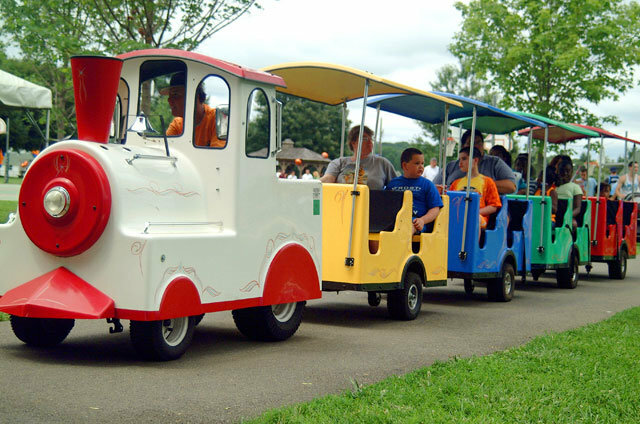 Trackless Train rentals and Carnival Ride Rentals are great for events, corporate events, company picnics, motion picture film industry and festivals. We have many cities who use this for holiday events and Christmas parades. Trackless Train Ride Rentals are delivered by BluegrassRides.com. This train ride features 3 cars that hold up to 12 passengers adults or children. The published rate is for $ 250 per hour on residential parties. Commerical rates will vary upon dates and number of guests.